I have been experimenting with making replica Fairbairn-Sykes for quite some time now (since my introductory article here in fact). I was fortunate to find a copy of the original design by Fairbairn himself including dimensions. However at the time I did not have all the lathe tools required to finish the workpiece. There are some very fine private purchase knives that have this smooth finish so I shall leave it much as in this image. I moved onto my next attempts recently after a long hiatus caused by a broken lathe. I used the same dimensions as before, though achieved a much higher level of accuracy this time. I cut two, one in brass, one in steel. This time I was able to drill perfectly central holes all the way through and knurl the outsides. These handles are based on the Second and First pattern knives rather than the more common third pattern, which have deep parallel grooves. As the third pattern would be more work to produce and are readily available I decided to focus on these. The handles are oil blacked. Steel is much easier to black than brass due to the recognisable colour changes that are very distinct. However I only had one blade profile so finished the brass handle first. The next step is to work on a rubber solution to the very thin blade. Most (all in my experience) rubber F-S knives bend when wielded and this really removes any sense of threat or realism which can ruin immersion in-game. If you like the look of these blades, drop us a line on enquiries.vintageairsoft@gmail.com to place an order. We can customise the knife to your preferences and provide them sharpened or unsharpened. You can also find us on Facebook. Don’t forget to follow the blog and get updates straight to your inbox! The first job is to create a mould from which I can make a resin casting. Mould making has been quite well covered elsewhere on the net by people much more expert than I so I shan’t go into detail here. I then poured a resin into the cavity which, when hardened produced a hard but semi flexible blade. Much like an airfix model, once the flashing is removed it takes shape very quickly. A bit of filing and sanding here and there gets a smooth surface overall. I then sprayed it black as a base coat. I then layered up the paints as I would for a plastic model. Blue-tack makes a great masking tool, allowing a really clean, sharp edge to certain areas. After an initial dark brown coat on the handle, I dry brushed a light brown paint over then top to create the impression of the light tropical woods used in older kukris. A finishing touch was the varnishes, different types for different parts of the knife to give the correct finish for the materials the paint is impersonating. I’ll be making a few of these as training knives and airsoft knives. Just email us on enquiries.vintageairsoft@gmail.com and join us on Facebook. Don’t forget you can follow the blog and get updates straight to your email inbox! As a result of this they made the unusual decision to make peace and ally themselves with the Goorkhas and even employed them as soldiers, considered widely in much higher esteem then the average sepoy (Indian soldier in Colonial pay). Since then they have served British interests loyally up to this day. ‘Ghurkas’ as they are now known also serve in the Indian Army and Shanghai Police. Their weapon of choice has always been the Kukri, a complete history of which could take a whole blog, never mind one post. Suffice to say that this blade has been used to pacify Indian mutineers and rioters, Europe in WWI and WWII and in the East against Japan. Even in recent years Gurkhas deployed to Afghanistan have used their Kukris in close quarter combat with the Taliban. 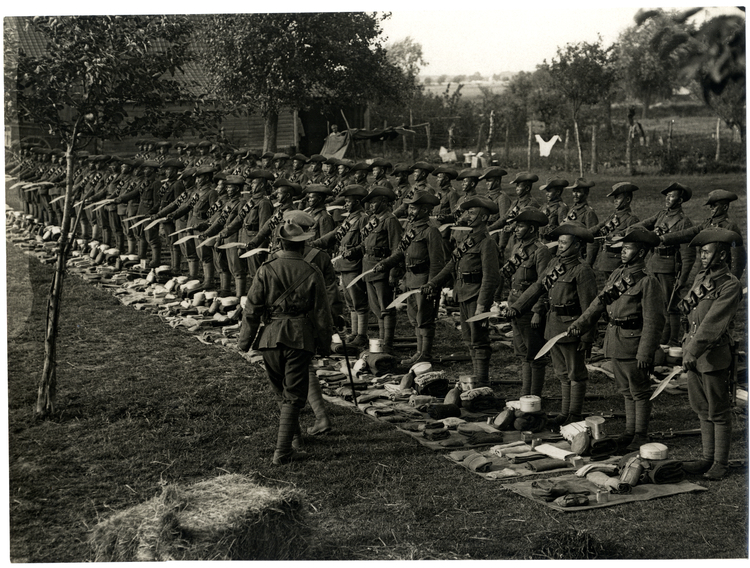 Gurkhas at kit inspection showing kukri in France during World War I[1/4th] Gurkhas at kit inspection showing kukris [Le Sart, France]. First things first, the new operating handle. Although the one provided with the ASG Sten is close enough to correct, I preferred the small, rounded operating knob as it is less likely to catch on clothing. For this build it is perfectly possible to use the original handle. In order to make the gun ‘safe’, the operating handle is pulled a little further back than the regular ‘cocked’ position. It is then pushed up into the lug above the channel where it usually runs when firing. On the real steel Sten, this simply stops the bolt from being able to reciprocate and therefore ‘safe’. In reality this was a far from perfect system and these guns still had a reputation for going off when dropped. As this is an AEG, this safety mechanism uses a microswitch to control current flow. The operating handle will be oil blacked for use, but it wouldn’t have shown up for the photos here to demonstrate so I left it unfinished. If you liked the look of this, drop us a line on enquiries.vintageairsoft@gmail.com to discuss or find us on Facebook. Don’t forget you can follow the blog and get updates straight to your email inbox! A little video about oil finishing that may interest some people. If you want to try this at home please do take care and follow my advice at the end! While skimming the stock to remove the varnish one thin area gave way in the pistol grip. This proved quite difficult to fill as there was no support to speak of underneath. Eventually, I managed to fit a piece of shaped wood into the space and affix it with wood glue. To re-enforce it I filled the space with resin. Once sanded and varnished it should disappear fairly quickly. I could then varnish the wood all over to seal it. I then oil blacked the remaining parts. I’ll be putting together a video on this process very soon. The oil blacked receiver in place. You can see the small, irritating gap between the top heat guard and the stock. I have managed to fix it by shaving some of it off in just the right place and adding a brace inside. Looking quite close to finished now! I’m tweaking a couple of bits to make it a little more usable and will be testing it soon. I also have to finish the scope mount for this client. This project has sparked a lot of interest so this model will be available as a kit. If this post has inspired you to want a gun of your own, do drop us a line on enquiries.vintageairsoft@gmail.com to discuss or find us on Facebook. Some of my followers will remember that I have had many, many issues with my lathe. Recently I have managed (with not a little help) to get it back into working order! There were quite a few jobs waiting for this, one of which was the MG08/15. This required a hop-up chamber. I turned this from a piece of 20mm aluminium. One hole drilled through the centre all the way kept everything aligned as I bored out the front and back to their appropriate diameters to take the nozzle and barrel. I then filed down the top create a flat surface, then drilled a feed hole to allow BBs to feed into the chamber and another hole that was tapped to adjust the hop-up. A second screw holds the barrel stable. I attached two barrel spacers to the barrel to centre it in the outer barrel. This done I attached the gearbox to it. I could line up the gearbox mounting plate with the holes used to attach it to the frame and marked out their locations. These could then be drilled and fitted permanently. More to follow soon! If this post has inspired you to want a gun of your own, do drop us a line on enquiries.vintageairsoft@gmail.com to discuss or find us on Facebook.